At the beginning of October 2017, I went to a conference by the name of the ‘Four12 Conference in South Africa’ with my new church “Kingdom Community Church”. It was hosted in Cape Town by a church called Joshua Generation Church. It was an incredible spiritual and emotional journey for me. I stayed with a host family from the hosting church, Vernon and Juan-Marie Franz. They welcomed me in as their own child, it was such an amazing open-hearted home and it was amazing to be with them. Day one of the conference was a pretty nerve wrecking experience for me because I didn’t know what to expect, but my host Vernon kept telling me it would be the best experience of my life and I needed to be expectant for God to work in my life. Over the years I’d built up quite a wall towards God and had blamed God for everything that had gone wrong in my life. It turns out that I wasn’t really scared of the conference, I think I was scared to face God again. When I walked into the conference venue I felt the presence of God in the building, everyone was so kind and loving, I felt like I was walking into the home of family I’d just never met before. It turns out that I wasn’t really scared of the conference…I was scared to face God again. At first I didn’t feel God doing much else in my heart and I began to contemplate why I had made the trip from Richards Bay. Then the second day of the conference arrived and that was when my life changed in a miraculous way. One of the speakers for the day, Hans spoke about how him and his wife had lost their baby and how they fought for their baby in prayer. Even though their baby had died, they were so happy that the baby lived for even just two hours. Suddenly all my pain of my own father abandoning me hit me. I wondered why he couldn’t have fought for me like that – the fight wouldn’t be nearly as hard, I’m alive. Hans’ words supernaturally touched my heart to such a degree that I started to cry, and couldn’t stop. Then I started to shake because I couldn’t handle all the love flowing through me from God by Holy Spirit. It was then that I heard Jesus’ voice clearly for the first time. He said to me “My child, don’t be scared, I forgive you and I will always love you, I am your Father. I will never leave you. I love you”. I was broken. It was such an incredible feeling, I can’t describe it. To be totally loved and totally accepted without having to prove anything. It felt like for the first time in my life I had a dad who would never ever stop loving me even if I make mistakes, even if I am distant, He will always be waiting for me with open arms and love me just the same. It was then that a total stranger tapped me on the shoulder and said he had a message for me. He told me that God told him to tell me that whatever had happened to in my past I need to forgive, I need to stop living in fear. He said God showed him a picture of me as a rugby fullback; kicking for poles to win the game. He told me in my trials when I feel so much pressure, I need to know that God is right there with me and I will be victorious in kicking my fears over the poles. In one week God changed my outlook on my life, I am not the same. I am glowing from the inside out. He has provided me with people from our home church to support the message I received at the conference and I am not listening to people who break me down anymore. I feel that for once in my life I have a purpose and a destiny! With God’s enabling I am going to achieve whatever He has planned for my life. Life, I’m ready for my penalty kick. Click here to watch the Messages from the 2017 Four12 Conference in South Africa. 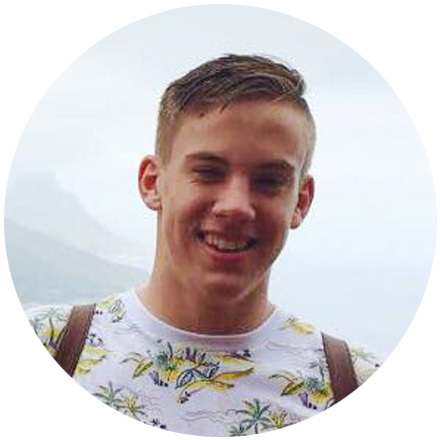 Mathew is a saint in Kingdom Community Church & currently a grade ten student at Richards Bay Christian School. He loves playing rugby and spending time at the gym. He has a real passion for the church and serving God.